Extra special, and eagerly awaited edition of Por Tan Kloi’s famous hun payont ghost soldiers in the from of the Dta Ba Khaw wise hermit, as commony used by Por Tan Kloi, great master of the Khao Or magical school of sorcery, and considered to be the master wicha holder for hun payont effigies in the south of Thailand. 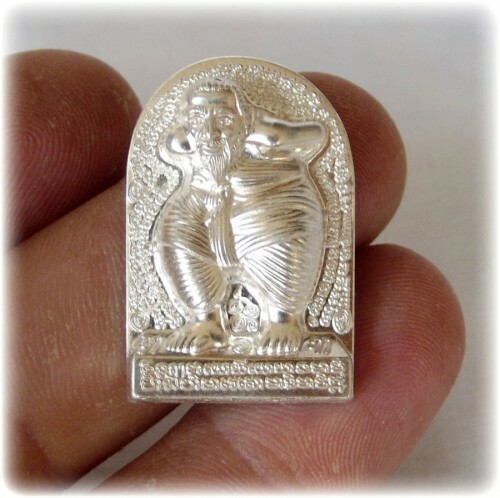 This particular model is in ‘nuea ngern tae’ (pure solid silver), and is the second from top in the edition of metallic coin amulets, under the solid gold version. 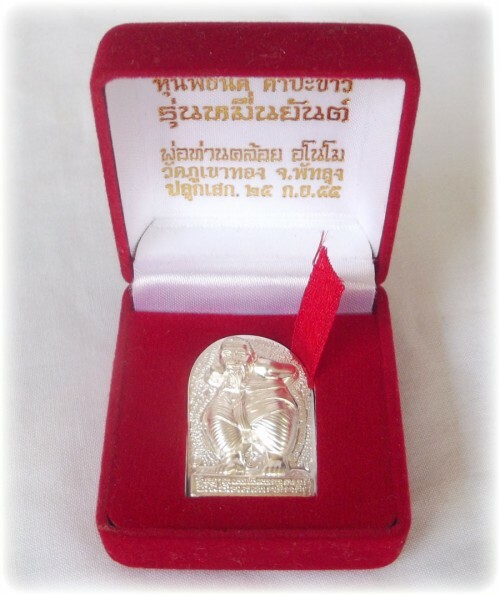 This is just one of a vast range of different versions of hun payont Dta Ba Khaw amulets made in this series from Por Tan Kloi, which have been awaited with great expectation from the southern Thai devotees of Por Tan Kloi, and by those who prefer the coin or powder type amulet more than loi ongk statuettes. This is thus the first time ever, that it is possible to obtain a hun payont from Por Tan Kloi in medallion form. Metallic versions are preferable if you are a clumsy person or feel that much vibration may damage a powder amulet. Thai people tend to prefer metal amulets for long term use and collection, for their durability. Sacred powders have of course their benefits, especially when it comes to metta maha sanaeh, or healing magic. 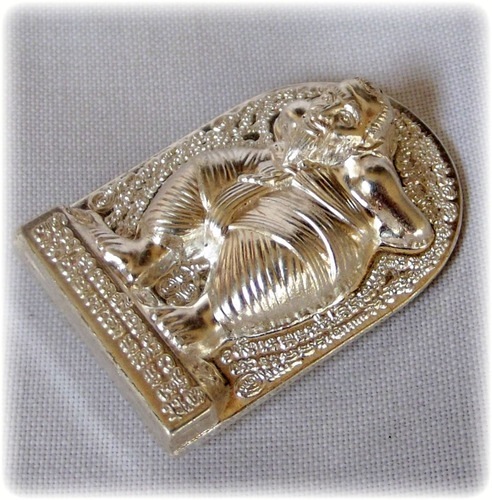 Kong grapan and klaew klaad as well as serm duang type blessings are all suited to metallic amulets. 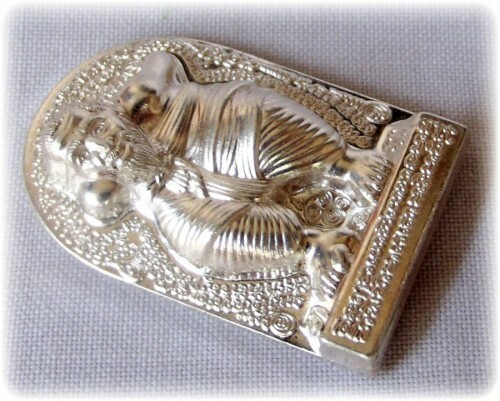 Size: 3 Cm high x 2 Cm wide – Completely suitable for men, women or children to wear this medium size amulet. These amulets were blessed and empowered in an extremely powerful, sacred and famous Puttapisek ceremony which hit major newspapers and even international publications. In addition to the hun payont, some sacred metal yantra coins with the ten thousand incantation yant were also released. 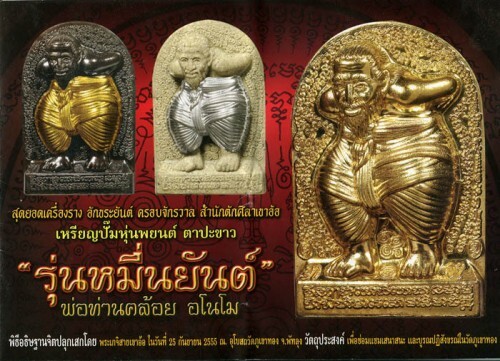 It is perhaps the most important edition since his first edition hun payont, and the yant coins released in the same edition have also recieved great preference and popularity in Thailand (fast running out already). 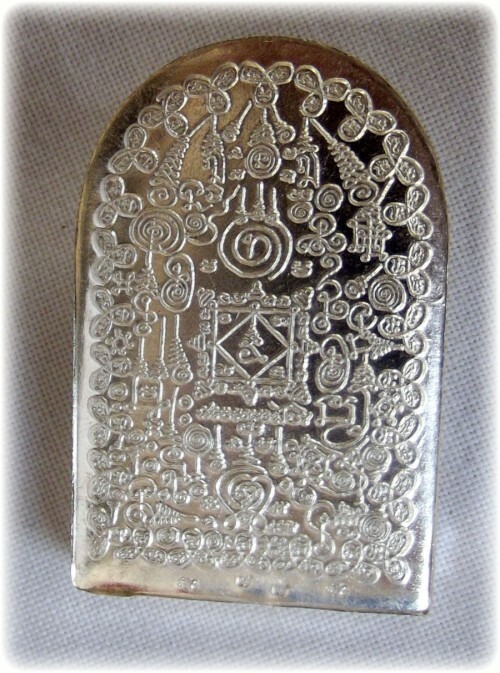 This is the upper range level of the series, which is made in pure solid silver, alchemically smelted along with sacred yantra foils with spell inscription from various masters and temples, with previous editions of amulets and sacred metals, with kayasiddhi minerals, to form an alchemical sacred alloy, born of fire and incantations. Many different sacred metal versions were made, some with precious metals. a range of eight different sacred powder based hun payont were also released in black or white powders, and also some special powder versions with varying colored metal trousers. The muan sarn powders of the versions with metal trousers are visibly richer in powerful components, herbs, pollens, kakyayaks earths and minerals. White powders are more Puttakun and metta orientated whereas black powders are more kong grapan and anti black magic. 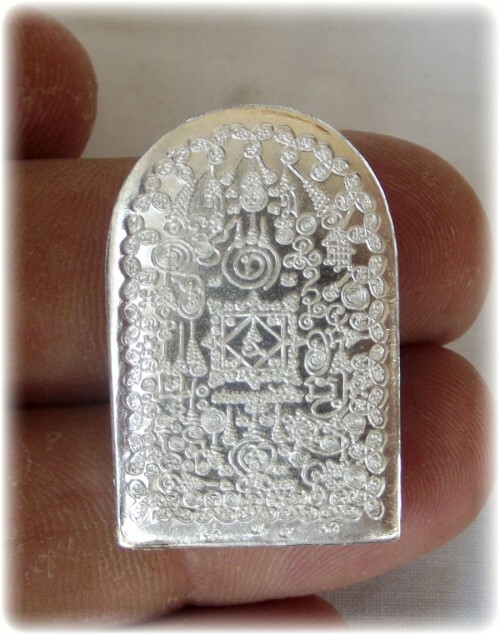 The rear face of the amulet has an ancient yantra inscription upon it with 10,000 sacred invocations, as do all amulets in this edition, which uses the wicha of the great ‘Hmeun (10,000) Yant’ to empower them with. 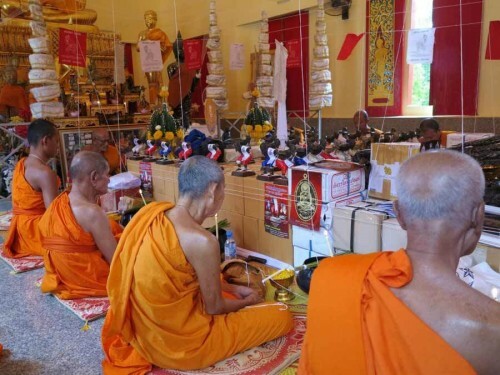 These Dta Ba Khaw hun payont spirit assistants, work as a kind of invisible guardian and valet, who cares for your safety and well being, protecting and nourishing. He can be used to complete and fulfill missions and tasks which are beyond your own abilities, in exchange for your making and sharing of merits with the hun payont. The ‘Dta Ba Khaw’ amulets were made in a number of different sacred powders and sacred metals, including mixed media of powder amulets with sacred metal trousers attached to the powder base, which in addition to the simply powder versions, were made with copper, brass, solid silver and solid gold trouser versions in both black and white powder versions. The black powder versions compose the same list of different metal trouser attachments. There were also some metal type versions made without sacred powder. Some of the gammagarn models had different metal trouser attachments too, which are of the higher priced varieties. There were some special versions made in nava loha, nava loha with pure silver, and nava loha with solid gold too, as well as solid silver and solid gold top models. The other sacred metal versions featured alpaca, alpaca with copper trousers, copper with brass trousers, and brass with copper trousers. Sacred lead, sacred copper and alms bowl lid brass versions were also made. So Sa A Ni So Sa A Ni Sa A Ni So A So A So Ni Ni Sa A So Ni So A So A Ni Yo Sa A A Ni So Sa Sa Ma Su. 7 different MP3 kata tutorials with different kata for the hun payont are included, which you can download instantly after purchase by logging in to your account and going to the files tab where your mp3 kata tutorials will be for download.